A huge number of Kickstarter game projects go down in flames. 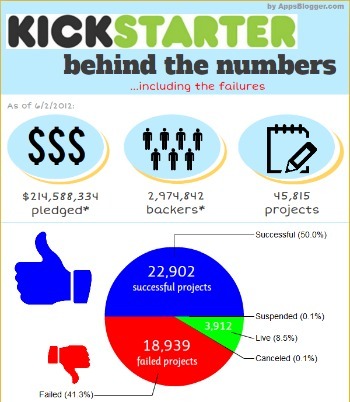 You may have wondered just how many Kickstarter projects make it, and how many don't. AppsBlogger Jeanne Pi knows; she crunched the numbers for over 45,000 projects, looking to see whether there might be lessons lurking in the data for future money-hungry fundraisers. The answer may surprise you, for, though Kickstarter's mega-successes tend to hit the headlines, only 8.5% of the projects examined made double their funding goal or more, while 41.3% crashed and burned. Of the ones that crash and burn, gaming projects rank high, with 57% of those never meeting their funding targets. It's not all doom and gloom for gaming Kickstarters. They do tend to attract the most backers, with only music and film or video projects being more successful at getting out the numbers, but their bloated funding goals may be a stumbling block to their success. According to Pi's data, projects with lower funding targets - something in the region of $5,500, tops - are the most likely to work, and gaming Kickstarters often have much higher benchmarks than that. You'd be forgiven for thinking that gaming was the most popular type of Kickstarter project, but it doesn't even come close. The winner in that particular horse-race is Film and Video, with over 13,000 entries, as opposed to gaming's relatively meagre 1,729 projects. Pi has a personal stake in this, as she's looking to Kickstarter to get funding for her own projects. "I believe there's value in understanding failure," she says, "and in this case, failure to get fully-funded in a Kickstarter campaign." Her numbers are current as of June 2nd, 2012, and she's turned them into a very handy infographic, which anyone interested in their own Kickstarter should take a hard look at. There's something here for everyone. For me, I had no idea theatre Kickstarters are as popular as they seem to be - and as successful, with 71% achieving what they set out to do. But then, they're not asking for a lot of money, and that seems to be the key: keep your goals modest, and you're more likely to get what you want.